That’s a gripping title if ever I saw one. Thanks to Freyalyn, who named the hat during the ‘Spinning for Weaving’ workshop on Saturday as I put it on to call the class to order. It’s hard to miss, especially as the coins and charms chime as I move. Wearing The Hat in public for the first time, hiking in Derbyshire. Two previous blog posts tell the story of the fabric of the hat: ‘The wrong fibre in the wrong place at the wrong time‘ describes how a highly unsuitable fibre preparation was re-processed to become something far more suitable (if any of the workshop attendees are reading this, note the use of a small cardboard loom-equivalent to establish whether the fabric would full), and ‘A project for the Cotswold.‘ briefly describes how I came to make a hat from it. I didn’t post more because the description became an article for Spin-Off Magazine (Summer 2014, ‘Uzbekistan by Hat’. From left to right: the Cotswold warp as it came off the bobbin, after steaming to set the twist, and lastly the dry sized skein. The hat fabric on the loom: Cotswold warp and handspun ‘Falklands’ (unspecified blend of Romney, merino and similar) weft. I chose Falklands for the weft because I wanted to full the fabric, which I did in a hot indigo vat. Here the fabric is drying immediately after dyeing. I agitated it considerably in the vat to aid the fulling; the end result was not entirely even, but very beautiful. Or at least I think so. Samples of the fabric for my records. Despite the fact it would be difficult to duplicate these handspun yarns (not that I can see any reason to try), the samples are useful records of how the wools and the fabric behaved. 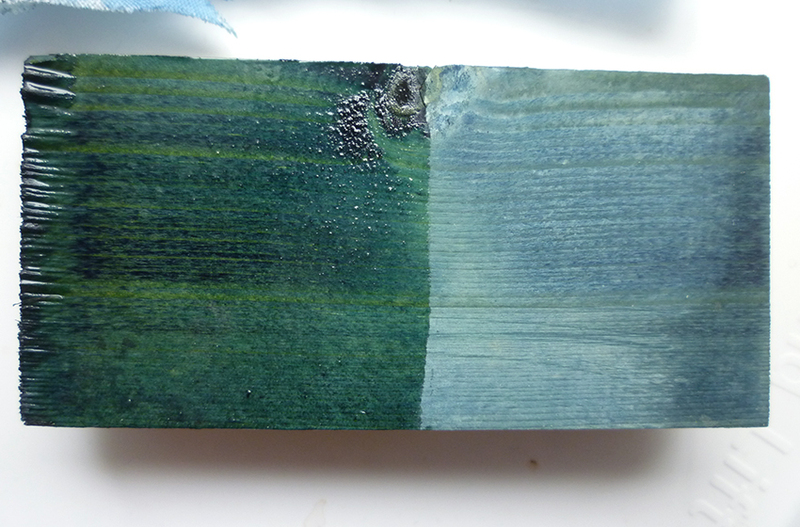 Note the tracking (the twill-like diagonal ridges) visible in the finished samples. I’d never made a hat from fabric. Clearly before I could make a hat I had to make a pattern. Having decided to make a hat inspired by those worn in Uzbekistan, I chose a style that looked as though I might be able wear it in public without dying of embarrassment, and started cutting up bits of paper to work out a pattern. My first attempt proved to be a tiny yurt suitable for wearing on my head. But after some adjustments and more waste paper, I tacked together a fabric version to test the size and fit, then untacked it for use in cutting my fabric. Time passes. A LOT of time passes. Sheila Paine and many others have written many words about the significance and meaning of folk embroidery. A gift from Sara Lamb, ‘Skullcaps of Uzbekistan‘ proved particularly interesting and useful. Reading and re-reading, I eventually could no longer postpone putting needle into cloth. What to use for the embroidery? 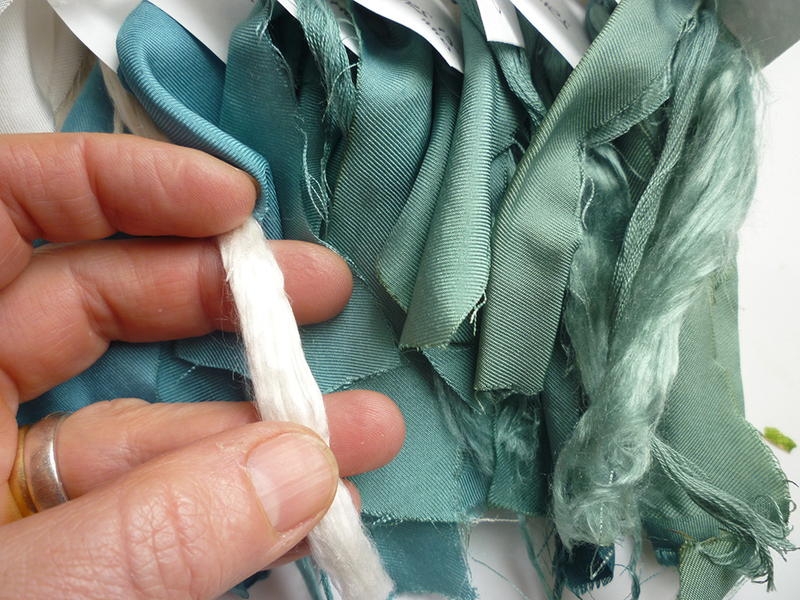 Silk, in bright – and significant – colours. Some I dyed and spun for The Hat (it had acquired initial capitals in my thoughts), some were thrums of silks dyed and spun for my tablet-woven bag. Research suggests traditional makers usually embroider the hat fabric before the pieces are cut but, as I had never made a fabric hat before and had very little clue about what I was doing, it seemed wisest to make a hat that fit and embroider that. Having used some of the finer silk to sew the hat together, I rapidly discovered that I needed guides for the geometric patterns, hence the lines of white sewing thread. Each of the patterns has – or is thought to have – a meaning or purpose, generally protective: bringing good fortune, or warding off bad luck and demons. The colours, too, have meaning: in many cultures across the globe red is apotropaic: it wards against evil. In the photo above, the maze of complex swastikas is a demon trap in the making: entranced by the complexity they wander into the maze and are lost. The mirrors of the shisha embroidery dazzle and confuse any that elude the maze. Above, ram’s horns symbolise strength, courage and protection. Below, one of my personal favourite symbols, a non-traditional orobouros symbolising infinity and the cycle of life becomes two owl eyes to frighten demons. The mother-of-pearl buttons used for the eyes and the silver coins are traditional embellishments, catching the sun to distract and confuse evil spirits. Below, just visible on the left side band are two traditional Uzbek stylised birds. Apparently there is an old belief that if a bird sits on a man’s head it will make him happy (don’t ask, I don’t know). At the front is a sun disk, offering protection from the evil eye and any passing impurity. It is flanked by guardian cats. Somewhat distorted by perspective, at the top of the hat is a band of shepherd’s crooks (protective), below which is a band of ‘amulet triangles’. Thought to be based on very, very early depictions of the Goddess, these are protective. Some of mine have diamond-shaped ‘heads’ containing four squares, the shape known as ‘fertile field’ that usually means fertility in the sense of offspring but I’ve used as heads because I’m interested in fertility in the sense of ideas. Tiny gold stars (light to distract demons) and the s-shape that may be a greatly simplified dragon (protective) also appear. Dangling from the top of the hat are glittering, noisy coins and a miniature silver Maes Howe ‘dragon’. When I presented my project to the spinning group I found my voice breaking with emotion as I tried to convey how I’d felt as each stitch linked me more closely to the many, many others who for millennia have made clothing to protect those they loved. Writing this I find the same emotion rising again. Think of the work involved in making a garment, even a hat, when women clothed their families in the days before millspun, machine-woven cloth. Gathering the fibre, preparing it, spinning it, weaving it, thinking of the person for whom you’re making it. Saving and bartering for cherished bright silks, shiny coins. Hoping and believing with every stitch that your embroideries are more than embellishment; you are creating a garment that may offer guidance and protection to the person who wears it, a tangible expression of your love and skill. We’ve lost that. Our lives are so much easier… but we’ve lost something along the way. This entry was posted in historic textiles, making things, spinning, weaving and tagged dyeing, embroidery, hats Uzbekistan on April 4, 2017 by sarahw. Ethel Mairet is one of my weaving ‘ancestors’, in that my mentors were taught by people who were themselves taught or inspired by Mairet’s work. I had the pleasure of seeing some of her weaving in the flesh at the National Portrait Galleries ‘Anarchy & Beauty’ exhibition, including a jacket woven from handspun eri silk dyed with natural dyes, here shown in A Weaver’s Life: Ethel Mairet, 1872–1952. Mairet moved to Ditchling, Sussex, in 1916 to join a group of crafts persons including Eric Gill. In the same year (Wikipedia is wrong) she published A Book On Vegetable Dyes (free download from archive.org at that link). Now, a century later, Ditchling Museum of Art & Craft is celebrating Mairet’s work, asking dyers to recreate her recipes for display today. At heart I am about 5 years old: I cannot resist making blue using a smelly technique that other people find revolting. But more importantly, the indigo urine vat is one of the oldest methods of dyeing. I wrote about its history and chemistry here as part of my Summer of Blue. That vat suffered as a result of my inability to keep it warm, but I’ve since found a way to maintain the necessary temperature. I put the ‘donations accepted’ container in the bathroom and a couple of weeks later the experiment began. All natural indigo powder contains some non-indigo vegetable matter, the proportion of which is reflected in the cost per gram. The vegetable matter is undesirable not only because it isn’t indigo (and hence doesn’t dye), but also because it adds to sediment at the bottom of the vat that can stain things that contact it. I know from experience that bacterial breakdown of the urine creates sediment anyway, so I used a cheaper grade for this vat, adding about 15g of powder to the 2.5l of the stale urine in a 3litre jar on the 27 November. At this point – having been stored at cold room temperature – the urine was at pH8 and smelled largely of stale urine with very little ammonia. The first time I made a sig vat, I tried everything I could think of to keep it warm, from black plastic bins in full sun (or what passes for full sun in a British summer) to an insulated box and a hot water bottle and finally a heating pad. Nothing worked consistently: slow/occasional fermentation would bring the vat into condition, I could dye a small quantity of fibre – and then it would stubbornly remain blue and miserable for days. That failure – when the instructions seemed so straightforward! – drove me to find out how and why indigo vats work. Now I know temperature was probably only one of several failures, and I have the tools to check and correct the performance of the vat. Last summer I built a den in the garage for my indigo fermentation vats: a sturdy cardboard box floored with a thick layer of insulation, with a tray acting as lid. The cord running into the box powers a home-brew ‘brew band’ that keeps a vat at blood heat. During the summer I used it to heat a large volume of liquid in that plastic bin, but here the bin is a waterbath for the urine vat in the glass jar. I put the jar in the bath to warm overnight while I wetted the yarns from the Ditchling Museum. The plastic screw-top bottle hiding shyly to the left of the box is my ‘spare’ urine supply. Fermentation vats rely on the nutrients in the urine, so I soak dyestuffs in urine to wet them: wetting with tap water will only dilute the urine and weaken the fermentation. On 28 November, after only 24 hours of warmth, the vat was alkaline, at or near pH10 and smelled noticeably of ammonia. HURRAH, bacteria are digesting the urea in the urine, consuming oxygen and creating ammonia to raise the pH: in other words, this vat is working! I added the four yarns, each skein suspended by a string to prevent it falling into the sediment that would develop at the bottom of the vat. This wasn’t entirely successful, alas. Better to use a deeper vat with a lot more urine. Taking photos one-handed with an iPhone when also handling something with a pungent, penetrating and lingering odour proved tricky, so I don’t have many photos of the process. Here you can see the characteristic yellow-green of an active indigo vat turning blue before my eyes. By 10 December the vat was at pH8-9: regular opening and airing allows ammonia to escape as gas, so the liquid became less alkaline, while moving the yarns about added oxygen. Both of these mean more indigo in the vat was returning to its blue non-soluble form. I didn’t, and I wouldn’t say it. All my research suggests indigo isn’t fixed in that way: once the colourless soluble form oxidises, the particles are either wedged firmly in place or they aren’t. I suppose dock root decoction might act like a glue to coat the yarn and hold the particles in place, but that’s only going to last until the glue is washed out. I called it a day, removed the yarns for the last time and left them to fully oxidise, slightly thankful that the cold weather means the smell is somewhat less all-pervasive than it was in the summer, when my husband claimed the odour was killing birds as they flew past. Well, for some meanings of the word ‘fast’. Slow in terms of time, but fast in the sense that it’s generally regarded as wash- and lightfast once any unattached particles of indigo are removed. Jeans and other items dyed with indigo lose colour as the surface of the fabric erodes to reveal undyed material. I handwashed the skeins in a non-bio detergent for delicate fabrics and rinsed thoroughly in cold water. Given the alkalinity of the vat and our extremely hard water I finished the wool and silk in a final rinse acidified with vinegar. The yarns and process summary, about to be packed off to Ditchling. 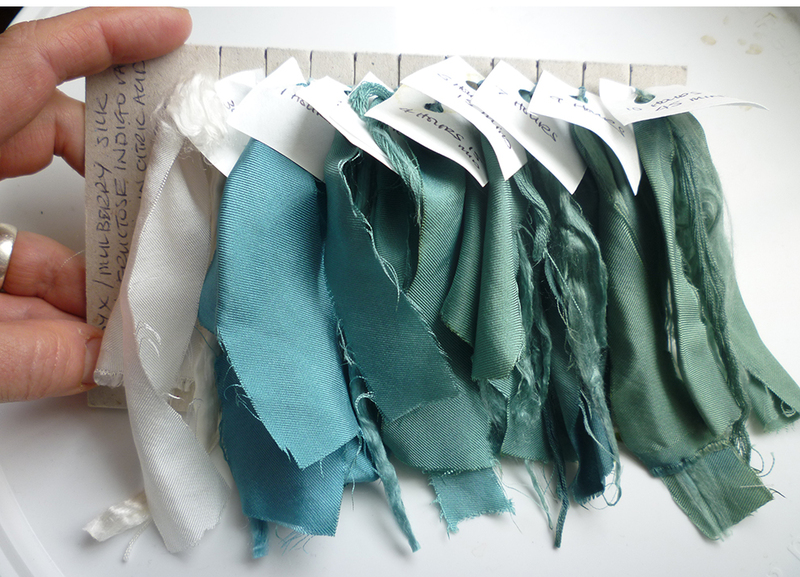 I am pleased to report they not only demonstrate one of Mairet’s dye recipes, but also the classic ‘vat odour’ that once indicated the finest and fastest shades of blue. *my work on the second recipe, ‘Extract of Indigo’ (treated with sulphuric acid!) can be read here. This entry was posted in Indigo, Uncategorized and tagged Ditchling, dyeing, fermentation vat, Sig vat, Urine on December 12, 2016 by sarahw. Just to prove I’m still playing with indigo, although I’ve had less time than I thought I would. If you’ve only got a few leaves, try leaf prints. 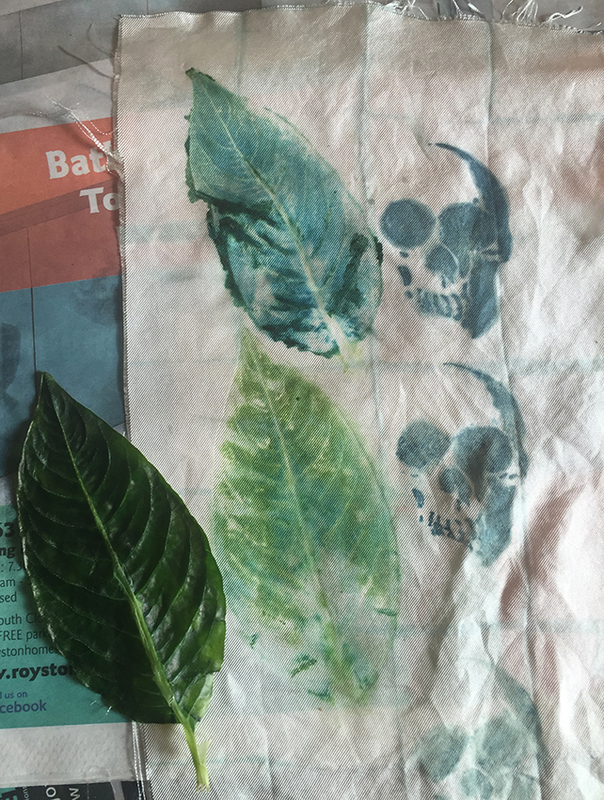 Leaf printing seems to work best on finer fabrics like this silk; I tried it on a heavier cotton/light canvas, and the juice didn’t penetrate far enough to make a good print. Take a leaf, put it on the fabric, cover it with a piece of clear plastic/heavy cellophane (I used a piece from a packet of oat bran). Take a dessert spoon and hammer the leaf with the bowl of the spoon through the plastic; try to make sure you cover (damage?) the entire leaf area. I think this breaks the cells to release the juice. 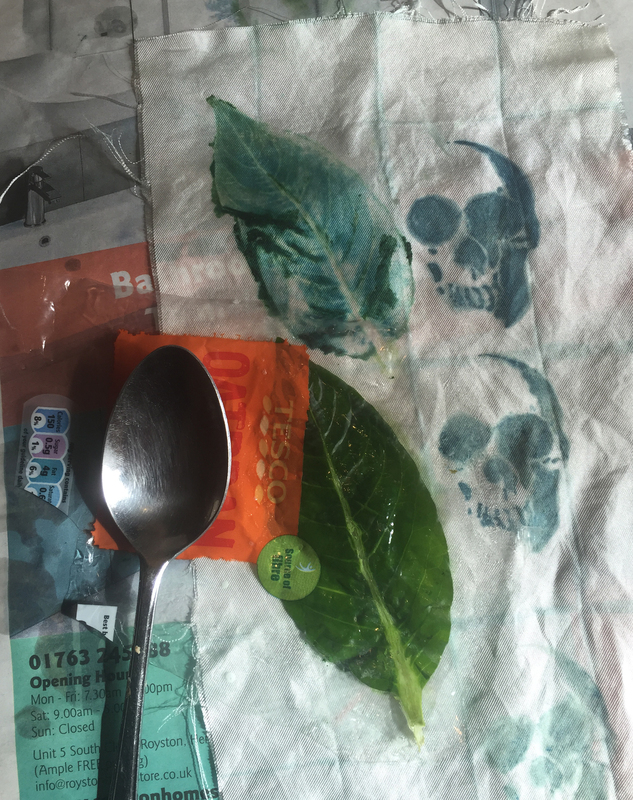 Then put a dab of washing-up liquid on the plastic to act as a lubricant (don’t get it on the cloth) and ‘polish’ the leaf through the plastic, using lots of pressure. Too much and you can see the leaf squash into mush that obscures the detail; too little and the juice isn’t pressed into the fabric. Practice. Have fun! 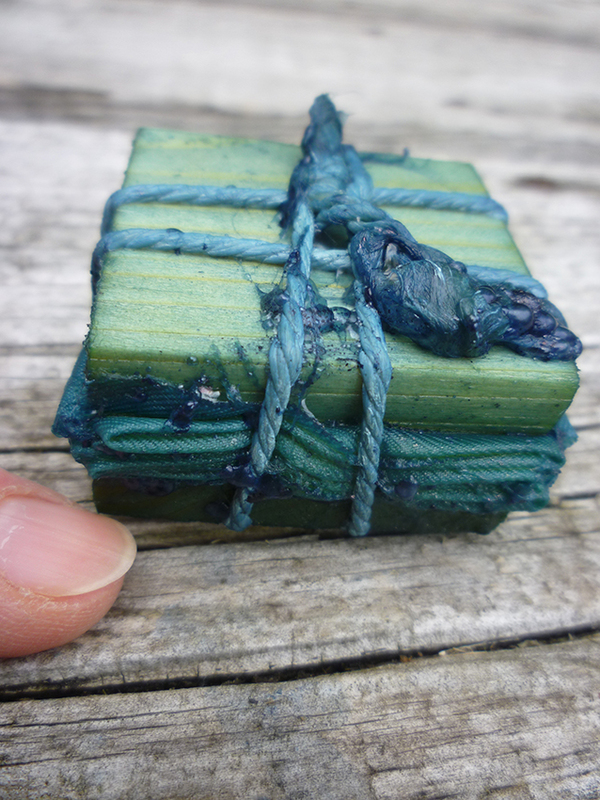 This entry was posted in Indigo and tagged dyeing, Handmade, Homegrown, indigo, SummerOfBlue on August 20, 2015 by sarahw. pH damages protein fibres: a test. “Protein fibres prefer acid conditions; plant fibres prefer alkaline conditions” is a truism that I’ve repeated myself on many occasions. It’s a commonplace when discussing indigo dyeing, as the vats are generally alkaline: indigo is more soluble at high pH. Warmth only makes things worse: hot alkali is said to cause damage faster than cold. Liles and others mention the risk posed by the vat fluid “Indigo vat fluid may be allowed to dry on cellulosic fibres but should never be permitted to do so on protein fibres, since the alkali becomes more concentrated as drying proceeds” ( JN Liles, 1990. 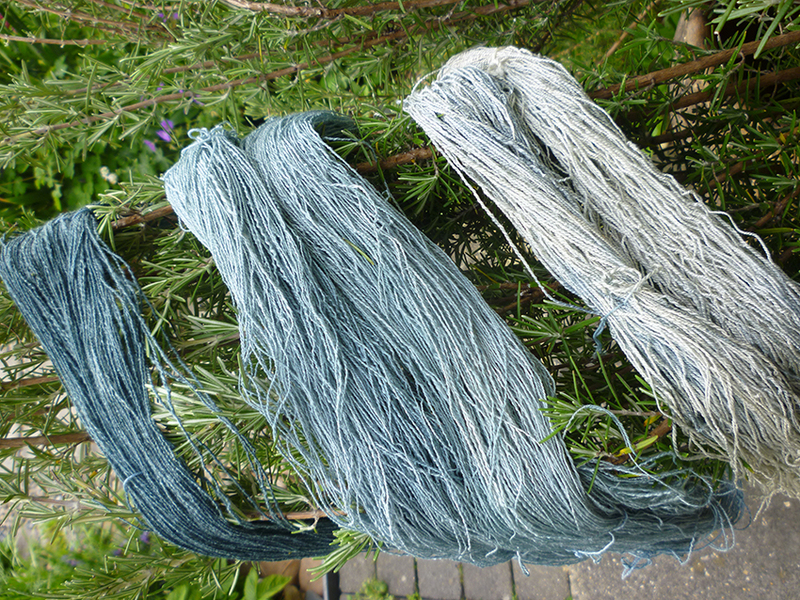 The Art and Craft of Natural Dyeing. University of Tennessee Press). In accordance with this I don’t allow the vat fluid to dry on my silk and wool; indeed, I sometimes put dyed goods into a citric acid rinse as soon as they’re cool, then plunge them into cold, thoroughly oxygenated tap water. The theory behind the cold rinse is that not only does this rinse out alkali not neutralised by the citric acid and oxidise the indigo compounds, it washes out loose indigo particles while they’re still truly loose, not dried onto the yarn or fabric to wear off later onto skin or other garments. But I’ve been wondering exactly what damage alkali does, and how quickly the damage occurs. Should I be quite so paranoid when working with wool and silk, counting the minutes that the dyestuff is in the vat? I decided to investigate. Bombyx aka Mulberry Silk seems more fragile than wool and therefore more likely to reveal damage. I took samples of commercial silk fabric, yarn, and Bombyx spinning fibre, tied them into bundles and submerged them in a 1-2-3 Fructose vat. I tested the pH of the vat at the start of the session and every time I removed a sample: it was over pH11 the entire time. The vat was maintained at 50–55°C for the duration of the test save for a brief overheating to something like 65°C for about 30 minutes between 2 and 3 hours into the test (I forgot to turn the gas off! Oh, for a water bath). The samples were removed from the vat, cooled slightly, then briefly rinsed in a citric acid solution (pH4) before further rinsing in cold tap water and air drying. Undyed silk; 30 mins; 1 hour; 2 hours; 3 hours; 4 hours 15 mins; 5 hours 15mins; 7 hours; 9 hours; 10 hours 45 mins (I had to go to bed, the next day was a gym day). I think there’s a visible difference: after nearly 11 hours at 50°C or higher at >pH11, the silk on the end is less lustrous. As the photo suggests, it’s lost some of its drape, its flexibility. The difference is more obvious in the hand: that silk is ‘cottony’, it’s not as smooth as silk. So, that’s likely to be one aspect of pH damage. To me, the most interesting thing is the time it took for the damage to be noticeable. (Note: the temperature peak 2–3 hours in is likely to have had some effect, but I don’t think it’s terribly significant – there’s no perceptible jump in the degradation at that point.) I can’t detect a difference between the undyed silk and that which was in the vat for an hour. I’m not even certain there’s a significant difference between the 1 hour and 3 hour samples; beyond that, the fibre does seem to be more cottony. The depth of the blue colour doesn’t change from 30 minutes, so there’s no benefit to leaving it in longer. It seems likely to me that the damage is cumulative, so caution is indicated when dipping repeatedly for darker colour, but still there’s far more leeway than I feared. I’m no longer going to count minutes and seconds when silk or wool is in a chemical vat for 15 or 20 minutes. The colour change intrigues me. Again, the blue had a greenish tinge at 1 hour, so it’s not attributable solely to the temperature change. Is the alkali causing the silk to yellow? I need to try this again with washing soda and plain white silk. 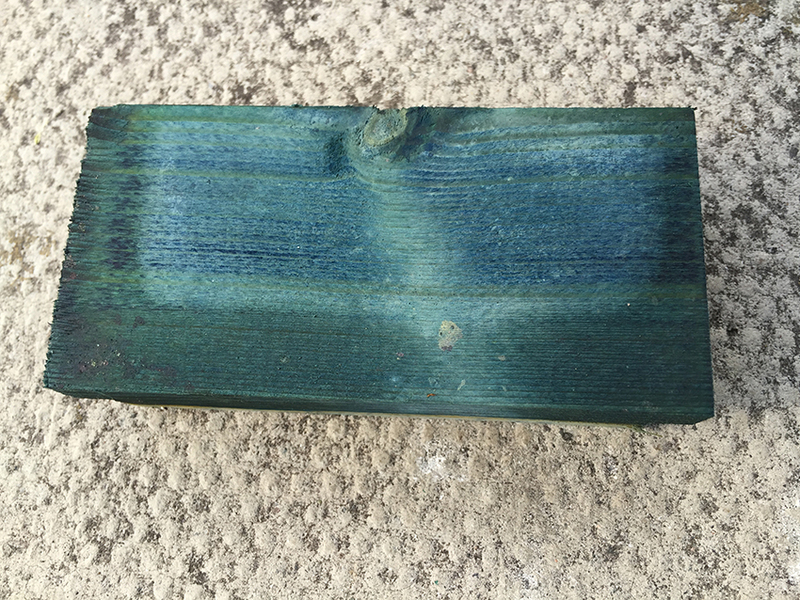 This entry was posted in Indigo and tagged alkalinity, dyeing, indigo, pH damage, silk, SummerOfBlue on June 14, 2015 by sarahw. So what am I doing with the vats? At this point I’m primarily interested in seeing how easy they are to assemble and run, and what the pH is, information that will help me to choose vat methods for dyeing projects in the future. Mostly I will be dyeing wool for spinning and spun yarn for weaving, but it’s a shame not to investigate other possibilities. Fabric is an obvious choice; it would be impossible to dye garment lengths in my relatively small jars, but I can play with techniques I haven’t used before, such as shibori. Well, used seriously. Like anyone growing up in the 1960s and 70s I did my fair share of mad tie-dyeing, but there are many other, more disciplined techniques. I have a thing about grids, regular patterning, so itajime (shibori patterning created by pressure) with squares of wood caught my eye. 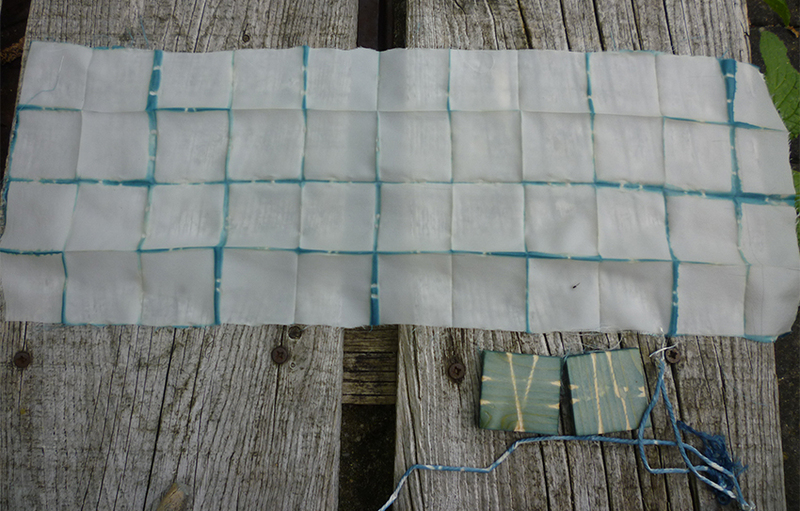 Two 1.5″ squares of board, some string and a strip of silk were easy to assemble… on reflection, for my first attempt, I should have tried larger squares and cotton, because ironing the slippery silk into the necessary neat square packet was exceedingly difficult. Tightly tied between the squares, the folded silk was thoroughly soaked in tap water with a drop of detergent as wetting agent before spending about 10 minutes in the fructose vat, reheated to 50°C and revived with 5g indigo, 10g, calcium hydroxide and 15g fructose. Lots of room for improvement, but proof of principle nonetheless! Note the rather pretty patterns on the wood squares. Indigo will dye anything that has roughness to trap the particles. Tokushima Prefecture in Japan is trying to find new products for its traditional indigo vats, including wood for speaker cabinets and mug mats as well as fabulous flooring. I moved the fructose vat into a jar in the greenhouse after dyeing the silk in it last weekend; although it was not heated, I noticed there was a thin flor on the surface, so I dropped a scrap of wood into it for a day, removed it for a couple of hours to dry, then put it back for another day. Fresh from the vat it was a beautiful green blue. 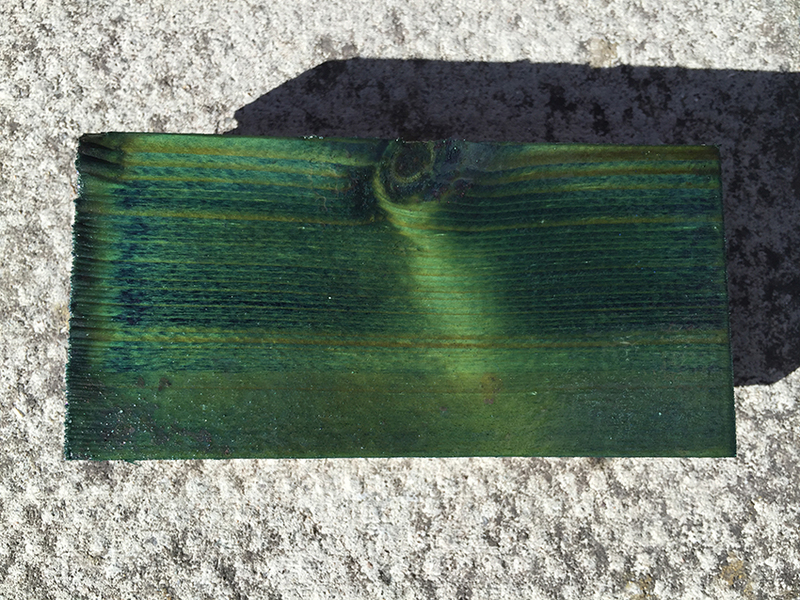 Note that the dense wood associated with the knot has absorbed less of the indigo. Almost dry and it’s definitely blue. Three days later, fully dry, I’ve given half of it a single coat of yacht varnish, the only glossy thing I have to hand. Sadly it’s slightly yellowing, whereas I think those floors are protected by a thick layer of perfectly clear polyurethane. But still, pretty. Worth a few more coats, I think. This entry was posted in Indigo and tagged dyeing, indigo, itajime, shibori, SummerOfBlue on May 31, 2015 by sarahw. The Fructose 1-2-3 vat: an indigo vat for the 21st century? Using only urine (ammonia) and natural indigo, the sig vat is perhaps the least polluting, most environmentally-sound of all the indigo vat recipes, but the need to collect and store urine, the smell, and the need for multiple dips to obtain darker blues meant the dyeing industry welcomed development of new methods of dyeing with indigo. By the late 20th century the (extremely convenient) sodium dithionite/hydrosulphite vat (the zinc-lime vat developed in 1845 is a type of hydrosulphite vat) was responsible for the bulk of indigo blue on textiles, but concerns about pollution associated with the process – toxic sulphites, sulphates, and sulphides are produced as degradation products – was increasing. In the late 1970s thiourea dioxide (effective at only 10–12% the usual concentration of sodium hydrosulphite), was being proposed as a more environmentally-sound reducing agent. Now, reducing sugars are under investigation. Reducing sugars contain or generate aldehyde groups that, activated by alkalinity and heat, will absorb oxygen from a solution. Fructose and glucose found in ripe fruit are reducing sugars; ordinary sugar – sucrose – is not a reducing sugar. So it’s possible to create an vat from indigo, lime (calcium hydroxide) and over-ripe fruit such as bananas, or dates that relies on the chemistry of the sugars rather than fermentation of the fruit. (There’s a blog post about a banana vat here.) But it’s easier to prove the principle using fructose from the supermarket shelf in Michel Garcia’s 1-2-3 recipe. It’s very simple: One Part indigo to Two Parts lime to Three Parts fructose, plus warmth. I warmed roughly 1 litre tap water (for the record our tap water is alkaline, roughly pH8.4) to 50–60°C in a saucepan. 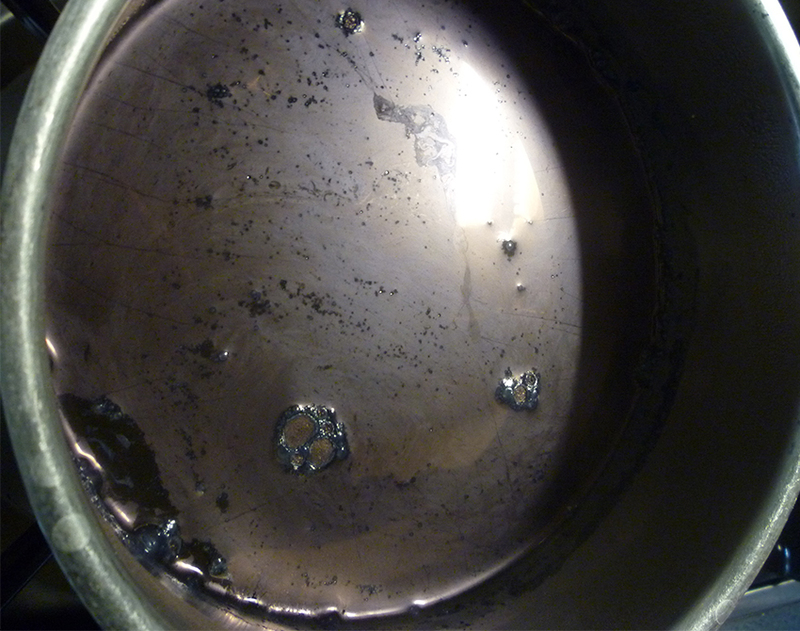 I dissolved 15g indigo – for this I used Tamil Nadu indigo – in warm water, added it to the saucepan, then did the same to 30g lime, then gently stirred in 45g fructose. The Tamil Nadu indigo is markedly ‘blue-er’ in solution than the ordinary indigo I’ve used up to now; the solution was a vivid deep blue. I left this to work for about an hour, at the end of which it showed all the signs that indigo had been reduced and the vat was ready. Vat ready for use. Note the flor, the metallic copper/purple/blue skin of indigo that forms where the reduced indigo oxidised on contact with air. In this vat there were metallic bubbles, too. Beautiful! Scrape the flor to one side with a spoon before adding materials to the vat, or remove it altogether and replace when you’ve finished. Beautiful, but the strong reduction is an indication of high pH and indeed, the pH paper read 11 or higher. 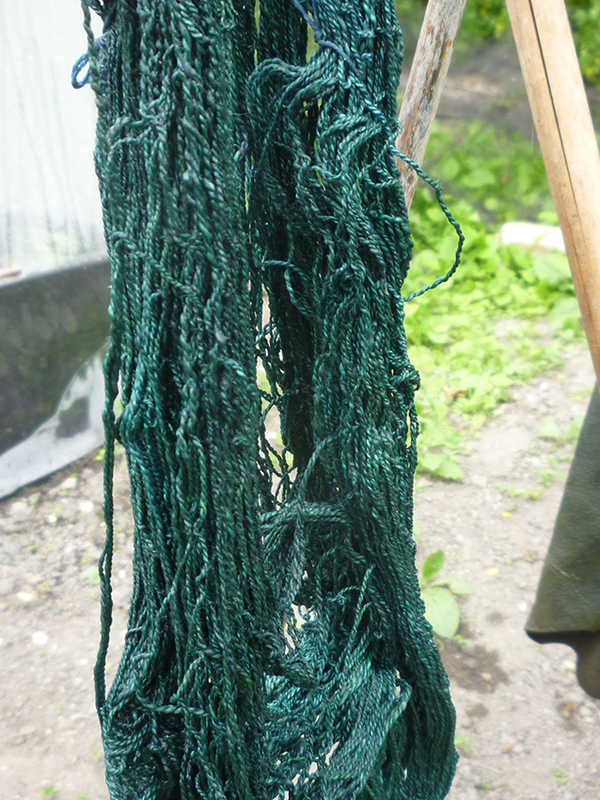 I added a skein of handspun silk, DRY, because I wanted to see what happened if I did so. The silk instantly went blue, as did the vat; wearing rubber gloves I squeezed air out of the silk until it sank, then reheated the vat to 50°C and left it to work, theorising that there was sufficent fructose to re-reduce the solution. 45 minutes later I removed the silk. Beautiful! I thought about a second dip, but worried about the effect of longer exposure to high pH and decided to wait to see what colour this became. After all, I have all summer to make things blue. Three silks for comparison: on the left, 45 mins in the fructose vat; in the middle, about 12 hours (two dips) in the sig vat; on the right, 90 minutes in the sig vat. Interesting! This entry was posted in Indigo and tagged dyeing, indigo, SummerOfBlue on May 31, 2015 by sarahw.